This has been the working theory: ESPN2's First Take is bad for the soul but awfully good for business. In late September, ESPN made the show the personal property of the professionally disagreeable Skip Bayless, turning the format into wall-to-wall staged argument. The conceit looked like a hit and seemed certain to metastasize: all debate, all the time, everywhere on the ESPN family of networks. With ratings up, ESPN is nevertheless poised to announce a change aimed at enhancing the show's popularity. Along with a set and logo makeover, the network is bumping up Smith, an often bombastic personality, from occasional visitor to full-time debater opposite Bayless. ESPN is doubling down on a good bet, in other words. But is it really a good bet? A look at the Nielsens over the past few months tells a different story about First Take and perhaps about the value of the new "debate" format. And behind the scenes, a source tells us, ESPN executives have begun to worry about the show, which seemed like found money not so long ago but which might turn out to be only fool's gold. Let's take a step back: The show wasn't always a dialectic demolition derby. The previous iterations of First Take (and, before that, Cold Pizza) had some variety—highlights and morning-style TV chit-chat and the like. That all changed when a new producer named Jamie Horowitz arrived in last August. "I looked at research, and the brand that resonated most for our fans was debate," said Horowitz, whose credits include SportsNation and Numbers Never Lie and has been an up-and-comer for years. In February, he got a big promotion to VP of the programming department. Sure enough, shortly after Horowitz took over, the show's ratings shot up. In July, the month before he began at First Take, the show averaged 223,000 viewers per day, according to Nielsen. By January, that figure had jumped to 420,000 viewers per day. The show saw total viewer increases for each of Horowitz's first six months as producer, according to Nielsen numbers, and ESPN PR went into hyperdrive promoting the great new success. But those numbers didn't hold. First Take has seen a decline in its ratings in three out of the last four months. It started in February when the show averaged 338,000 viewers, down from the show's January high. Total viewers averaged 349,000 per show in May, down from 367,000 in April. But the new First Take was supposed to be a triumph of format over circumstance. "Debate" is easy, after all. "Debate" doesn't have a season. 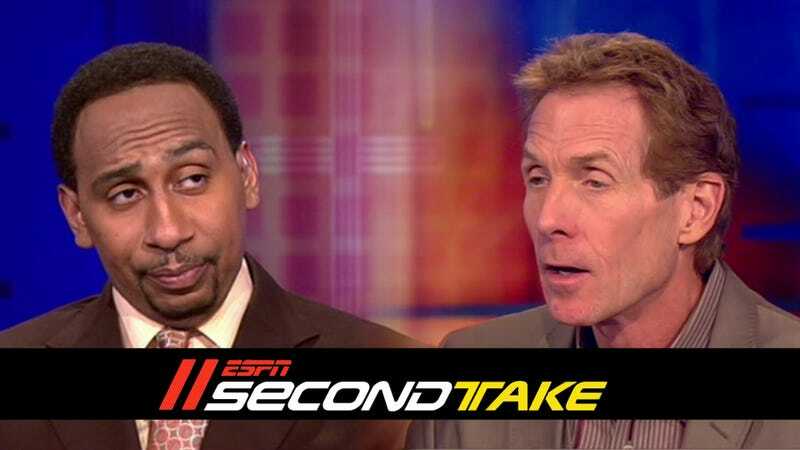 You can erect two poles on either side of any issue, and First Take's genius—if you can call it that—was to subtly raise the stakes by pitting Skip Bayless against black guests and letting the subtext, white grievance vs. "honky, please," do all the work. So why are some ESPN suits worried? Perhaps because "debate" hasn't been the silver bullet they thought it would be. In fact, sift the numbers a little and First Take's rise looks like something else: a miracle wrought by Tim Tebow. The show's biggest spikes in the past six months came during the week of Jan. 9 and the week of March 19. What happened during those two weeks? Well, Jan. 9 (average of 478k viewers, according to Nielsen) was right after the Broncos' OT playoff victory over the Steelers—the Tebow-to-Demaryius Thomas game—and the lead-up to the divisional playoff matchup against the Patriots. And March 19 (average of 465k viewers) was the week Peyton Manning signed with Denver, and Tebow was sent off to the Jets. Maybe the success of First Take wasn't about viewers' hunger for manufactured debate as a genre so much as it was about Tim Tebow himself. Bayless went all-in on Tebow very early. He became the chief exponent of the kind of priestly mystification and intellectual dishonesty that would eventually go by the name Tebowmania—the unending talk of intangibles, "all he does is win," etc. Horowitz built a lot of the show's identity around Bayless's mindless devotion to the quarterback, and from there the Tebow story was pure teevee conjuring. Bayless and First Take helped create the distorted phenomenon the rest of ESPN was obliged to cover, which gave Bayless and First Take more to talk about, which created a bigger and even more distorted phenomenon, which ESPN was obliged to cover, which is how we got this viral atrocity racking up more than 3.6 million pageviews on YouTube. Tebowmania was the perfect, and perfectly hideous, marriage of format and circumstance. Even now, in the depths of NFL offseason, First Take can't let go of Tebow. There's nothing to report on the Tebow front (Mark Sanchez still likes him), yet according to transcripts of the show, Tebow's name was mentioned more than 80 times between May 22 and May 29. This includes conversations about Tebow's performance in the Steelers playoff game—the one that happened five months before. In this light, the move to bring in Stephen A.—not a cheap one; combined, he and Bayless safely clear $1 million in salary, according to a source—doesn't look like the triumphal expansion the Los Angeles Times saw (or was encouraged to see). It looks like a quiet reboot of an already-once-rebooted show. ESPN remains outwardly confident about First Take. "The suggestion that there may be some concern at ESPN about the show's ratings success is absurd and the exact opposite of the actual sentiment," a network spokesman told us in an email. "The audience for the show is up 34% from year to year and we continue to invest additional resources to enhance its already strong performance." Last month, Stephen A. and Bayless were carted out for the network's upfront—its annual pitch to advertisers and media buyers—and staged a little faux-debate. This week, ESPN will have Smith and Bayless do their show remotely from the NBA Finals—another hefty outlay. But what happens if there isn't a significant ratings bump from Skip Bayless's delivering himself of his Very Controversial Opinions about LeBron James? What happens if Tebow really does just become a Wildcat and special teams specialist and the Tebow-Sanchez controversy never materializes? What if the show's ratings really have stagnated? "Embrace Debate," sings the show's tagline. OK, let's embrace it. Topic: Can Skip Bayless come through under pressure? Does First Take possess the clutch gene? Is Jamie Horowitz on the hot seat? Discuss.